Adam and Eve is a unique cave villa located at Imerovigli village.The villa is built high on the Imerovigli Caldera and can be easily reached from the village's main road. Adam and Eve villa has a personality of its own as it's furnished with antique and contemporary pieces, setting the scene for an idyllic and relaxing atmosphere. It is ideal for newlyweds as their honeymoon destination, or couples who desire a spacious villa and privacy. Due to its location, guests can enjoy a panoramic view of the island. 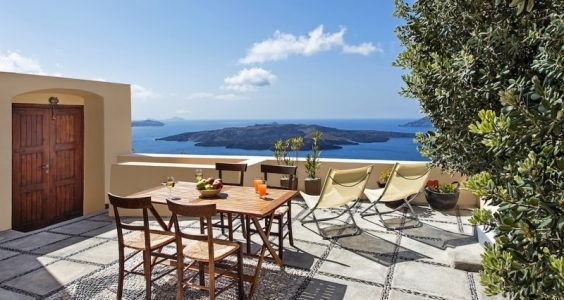 The spacious veranda overlooks the Caldera of Imerovigli and Fira, the volcano and the volcanic islands and the view extends as far as the southern part of the island and the villages of Kamari and Pyrgos. As the dusk sets in, the houses- which look like white cubes-, the lights and the view of the Caldera make up perhaps the most exciting multicolor mosaic with blue and white tones leading the way. 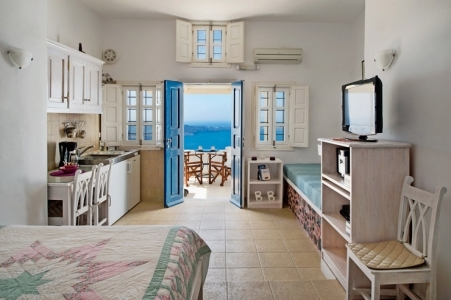 Heaven is a junior suite located at the village of Imerovigli. It is located high on the Imerovigli Caldera and can be easily reached from the main road of the village. It is a perfectly designed suite of 25 square meters that provides all the comforts. The property's outdoor space is divided in two levels. The first level is the private veranda which lies right in front of the house’s entrance. From the veranda you can enjoy the panoramic view of the island and enjoy your meal as it provides patio furniture and a corner shaped built couch ideal for relaxing and enjoying the panoramic view of the island. The veranda provides full privacy and gives you the impression that it is floating in the blue sky. The second level is definitely the hot spot of the property since it is a private terrace which lies right above the house. The terrace is literally a piece of art and provides one of the best views of the island since it is the highest point of Imerovigli! The terrace is equipped with two sun beds so that you can enjoy the sun and the incredible views of the island. The indoor space of Heaven provides a double bed, a small bathroom with shower and a living area with one comfortable sofa bed that can provide accommodation to one more guest. Moreover there is a fully equipped kitchen with a small fridge with freezer, cooking facilities and a dining table. The suite provides a double bed, a small bathroom with shower and a living area with one comfortable sofa bed that can provide accommodation to one more guest. Moreover there is a fully equipped kitchen with a small fridge with freezer, cooking facilities and a dining table. 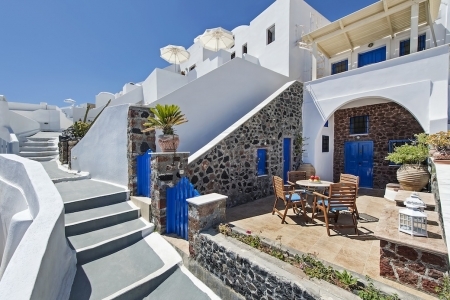 Coco & Belle is an amazing villa located in the peaceful village of Imerovigli, only 2 km away from Fira the busy and charming capital of Santorini. The villa's location is unique since it is built towards the edge of the caldera cliff and provides a spectacular view of the volcano, the caldera and the island. In order to reach Coco & Belle, one must go about 60 steps down from the main pathway of the village but the view is more than worth it. 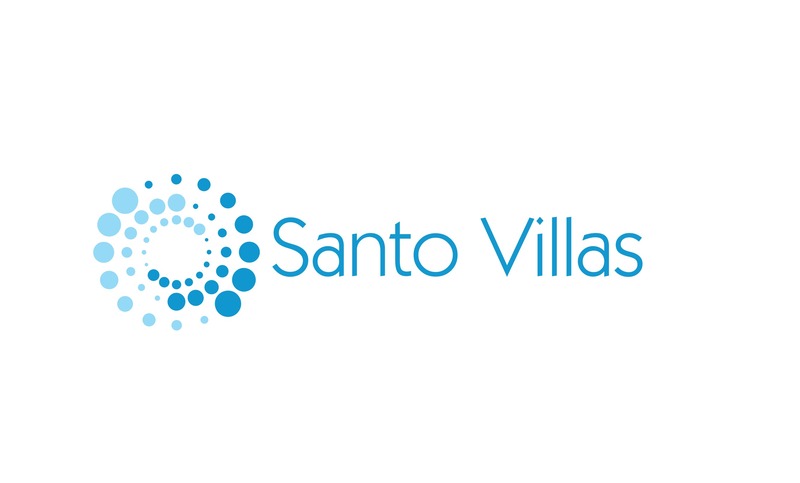 The villa consists of two units that are located right next to each other. The first is a unique cave house which can accommodate up to 4 guests (1 double bedroom, 1 single bedroom and 1 sofa bed). The second is a charming studio that can accommodate two guests (1 bedroom with 2 single beds). The two units combined offer a great opportunity to a group or a family to have a comfortable stay, as their residents has access to the spacious exterior, and at the same time keep their privacy inwards. The outdoor space of the villa consists of: 1) A spacious private veranda located on the same level with the cave house and the studio. 2) A spacious private terrace-deck with amazing view. 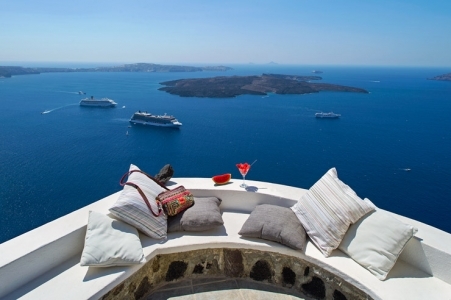 Mi Amo is a stylish suite that is floating literally on the edge of the Caldera cliff of Imerovigli. Its location is amazing and its spacious veranda has a perfect view of the volcano, the Santorini caldera and the rest of the island. In order to reach Mi Amo, one must go about 60 steps down from the main pathway of the village but the view is more than worth it. Mi Amo offers a private spacious private veranda of 25 square meters with two comfortable sun beds facing directly at the volcano and the Aegean Sea. The veranda is also equipped with a table, chairs and a sun umbrella. Kayo, is a stylish suite that is floating literally on the edge of the Caldera cliff of Imerovigli. Its location is amazing and its veranda has a perfect view of the volcano, the Santorini caldera and the rest of the island. In order to reach Kayo, one must go about 60 steps down from the main pathway of the village but the view is more than worth it. 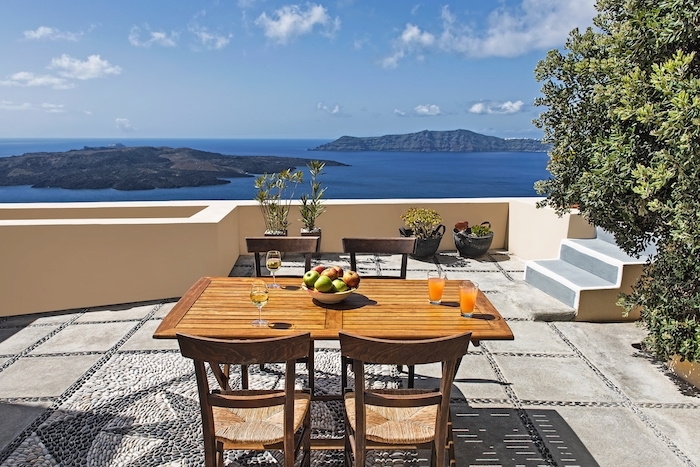 Kayo provides a private spacious veranda which is equipped with patio furniture, sun umbrella, and two sun beds and offers perfect views of the volcano, the caldera and the Aegean Sea. 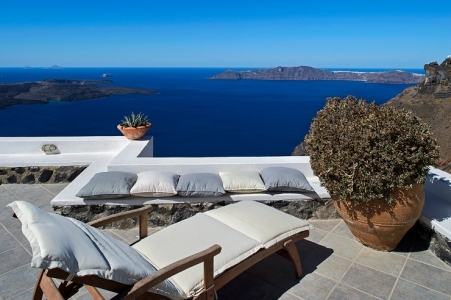 Aeon villa is located in Fira the capital of Santorini. The location of the property is unique since it is right in the heart of Fira, with the main road Gold Street being 5 minutes walk away. 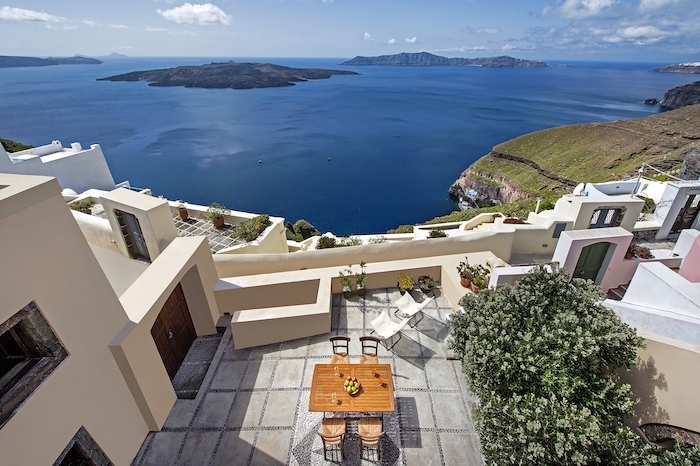 Aeon villa is built on the caldera (Cliff) of Santorini and provides wonderful, panoramic views of the volcano, the caldera and the rest of the island. 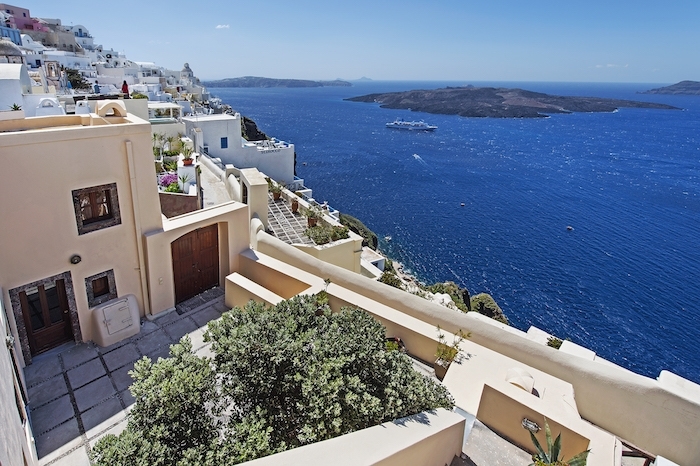 From your private veranda you can see the old harbor of Fira, Skaros rock in Imerovigli, and the view extends up to village of Oia at the Northern part of the island. Moreover the property provides wonderful views of the sunset. The villa consists of three separate units that are side by side and share the spacious veranda, which offers privacy and is ideal for relaxing and enjoying the surrounding scenery. The first unit measures 80 square meters and provides two bedrooms both with a double bed, and a very small room with a single bed. In addition it provides one bathroom and an open plan fully equipped kitchen. The second unit measures 70 square meters and provides one bedroom with a double bed. Moreover it provides one bathroom and an open plan fully equipped kitchen. The third unit is a two-story studio of 20 square meters in total, which provides one double bed on the ground floor, a shower room and a lounge sofa in the upper floor. The three units are always rented out together regardless of the number of guests so that the occupants enjoy their privacy in full. Cancellation up to 30 days prior to arrival: no charge. * Any cancellation within 29 to 7 days results in charge of 50% of the cost of stay. * Any cancellation within 1 to 6 days results in charge of 100% of the cost of stay. * No-show : 100% charge of the reservation amount. * Early departure : 50% charge of the remaining stay. For stays greater than 4 nights , a deposit of 30% of the total fee is required For stays of 2 or 3 nights a deposit of the fee for 1 night is required. All rates are quoted in Euros, per property, per night. Taxes and daily cleaning service are also included in the price. Une vue ? 360 degr?s sur la Caldeira, et une terrasse comme suspendue dans le ciel: effectivement, c'est presque le paradis. Merci ? toute l'?quipe. What an amazing view of Caldera! It is one of the best spot in Oia. Most photographed indeed. You could capture the 3 domes just a few steps going up the stairs and the night view of the cave houses a few steps just to your right once you are on the top of the stairs. What more could you ask for. For sunset you will need to take a left turn through the shops towards the Amoudi bay which is not far at all. Never seen so many wedding photo shoots. Lovely cave house. Tourists near the villa did not bother us. Stefanos was very helpful in arranging the transfers and Fitim to carry our luggage up the cliff. Would love to live at this Villa forever! We are a family of 4 with children in their early 20's. We chose Coco and Bella because of the bedroom arrangement, and also the view of the caldera sunsets. We were not disappointed with either! We experienced the sunset from Oia and all agreed that the one from our veranda was much more beautiful. In addition to the sunset, the staff was fantastic! Both Yannis and Zachos (the porter who carried our heavy luggage up and down the stairs!) were wonderful. We saw them almost daily as they helped other customers and always asked if we were doing ok, or if we needed anything. This house is perfect for a family with older children as the 2nd apartment with 2 twin beds is not directly connected with the main house, so not ideal for young children. The only other advice is that you need to be in good health (that goes for visiting Santorini in general!) as there are many steps down to the apartment, but the view is so worth it!! 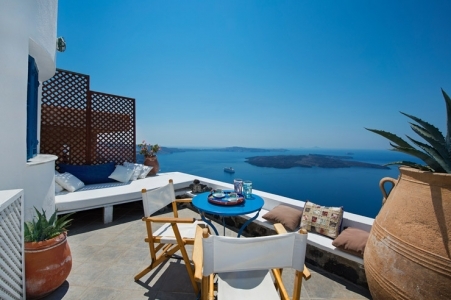 They say "location-location-location" What a perfect spot to stay in Fira. The view was beautiful and the rooms were lovely and comfortable. It was just perfect for a family seeking a get-away with unique Santorini style with all the comforts of home. We would definitely come back in the near future! Excellent stay. The view was amazing!! Thank you!! Awesome location. Literally the most photographed spot on Oia. The services and communication and customer service were outstanding. The house was clean and had daily cleaning. Fitm, the onsite contact, was great and helped us with our bags up the hill, stowing luggage, and transport. There are two main doors and separate entrances. Depending on your couples traveling together, there are only 2 private spaces and Bedrooms with doors. Great wifi. The location of Heaven overlooking much of the rest of Santorini, including the Aegean Sea below, is breathtaking. Sitting on the balcony or the sun deck above is a joy. The apartment itself is modest but equipped with the basics and is quite comfortable. The staff, Zachos and Yannis, went out of their way to provide a first class service - nothing was too much trouble and they went to great lengths to ensure our stay was a success. 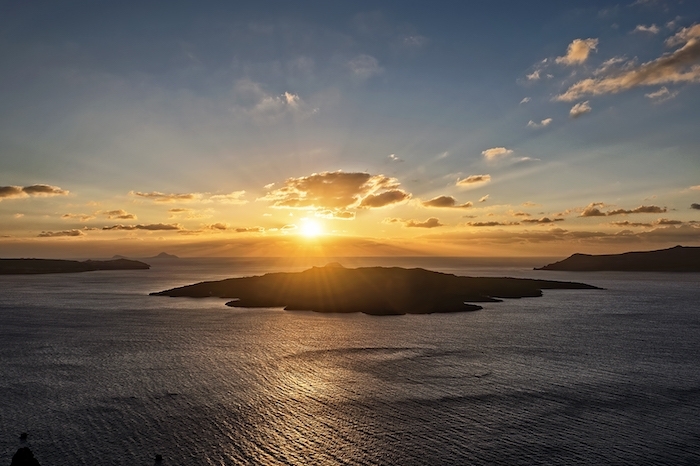 Imerovigli is less of a draw than other centers such as Oia, Fira or Firastefani, and we were pleased to escape the crowds in favour of Heaven. Incredible VIEWS with lots of space. 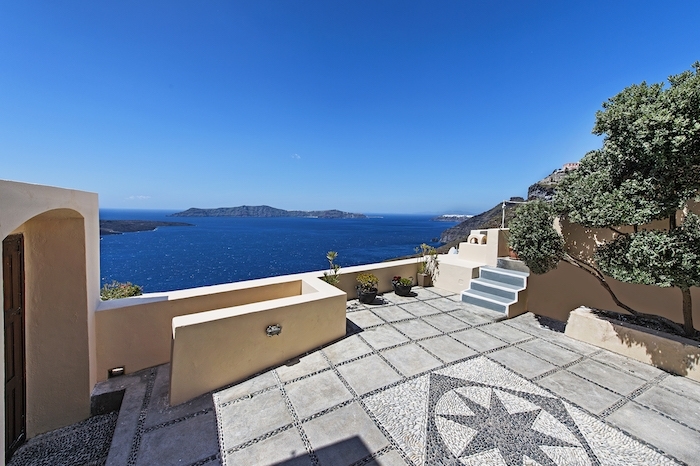 Unbelievable views and lots of space in the heart of Fira, and breathtaking views of the Caldera. The cave like home is spacious and yet homey. There are 2 wonderful balconies to enjoy the views and relax. The hosts carried our luggage up and down the path and stairs, and met all our needs. Wonderful hosts. I would recommend this place. And will for sure be returning! I really enjyoyed this stay. The location is one of best in OIA. I did a comfortable stay in this villa. Loved the location, amazing view of caldera. The apartment was cleaned everyday and was tidy. The view from the balcony was excellent and you can sunbathe on the two sun loungers, not loads of room though. You may get a visit from a couple of cats who we foolishly fed so made a few friends. Firo Stefani takes about 10 minutes to walk or less and Firo takes about 15-20 minutes . Overall, a great apartment. 7 of my family members and myself stayed at this villa and we all loved it! Stefanos was very helpful and knowledgeable of the island, and made us feel at home from day 1. We had a wonderful time in Santorini and would stay at this villa again if we ever come back! Wonderful experience! The view is simply amazing, like the location. The suite is perfect for a couple or 3 people maximum: we definitely recommend it!